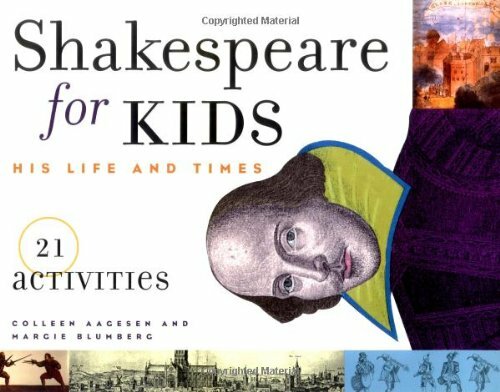 Kids can experience William Shakespeare's England and get their first taste of the Bard's sublime craft with this lively biography and activity book. Staging swordplay, learning to juggle, and creating authentic costumes like a flamboyant shirt with slashed sleeves or a lady's lace-trimmed glove bring the theater arts to life. Making a quill pen and using it to write a story, binding a simple book by hand, creating a fragrant pomander ball and a dish of stewed apples show what daily life was like in Elizabethan times. Inspired by scenes from Shakespeare's plays, kids can invent new words, write songs, and devise scathing or comical insults just as he did. Fascinating and accurate historical information and 21 fun activities open a dramatic new world of learning for children ages 8 and up. About Colleen Aagesen (Author) : Colleen Aagesen is a published author of children's books. Published credits of Colleen Aagesen include Shakespeare for Kids: His Life and Times : 21 Activities. About Margie Blumberg (Author) : Margie Blumberg is a published author of children's books. Some of the published credits of Margie Blumberg include Sunny Bunnies, Avram's Gift.